Which consumer brand do you associate with your bathroom? Is there one? There seems to be a dominant brand or two that is associated with most things in our everyday lives: Del Monte or Libby's in the pantry; Maytag or Whirlpool in the laundry room; LG, Samsung, Sony in the den. There are a few that receive heavy consideration in each instance. But the bathroom? That's a land of opportunity for brands. Sure, there's a dominant brand for each bathroom function – Charmin, Neutrogena, Crest, Pantene or Paul Mitchell, Oral B. There are heavy hitters at the product level, but no brand owns the entire bathroom. Yet. I think that Dollar Shave Club is on its way to staking their claim to a full bathroom takeover. And since men now spend more on toiletries than on shaving products, there's a good reason. DSC started by disrupting the razor blade industry and then quickly went to all things facial for men. Then hair grooming products. Now they are extending into grooming products for travelers, sanitary products and other ancillaries. It all seems pretty natural – once you have a good clientele base you want to maximize that opportunity. But what I love about Dollar Shave Club's strategy is their bathroom associated content. They are experts at the bathroom. And in the bathroom. And because they are experts, I trust their product recommendations and will buy more and more of what they sell. Experts in the bathroom? Yes. If you're a customer you know that every shipment comes with some reading material that they call "The Bathroom Minutes." It's not just information about your face either. There's timely content to grab your attention (spring stuff this month) and bathroom tips sprinkled in. Maybe something on removing a stain from your tie, or treating a blister on your foot. Stuff that's just good to know, and then stuff that makes you want to try out some after-shave balm with high SPF, or order some travel wipes. All easy to read content and very approachable. Then, there's their e-newsletter. It has more content that proves that DSC knows all about bathroom stuff. The grooming stuff. Bath stuff. Gross stuff. They're the experts because they're telling me things that I didn't know I need to know – but I'm better off for it. Whether about my fingernails, ear wax or body soap. And the trust grows. 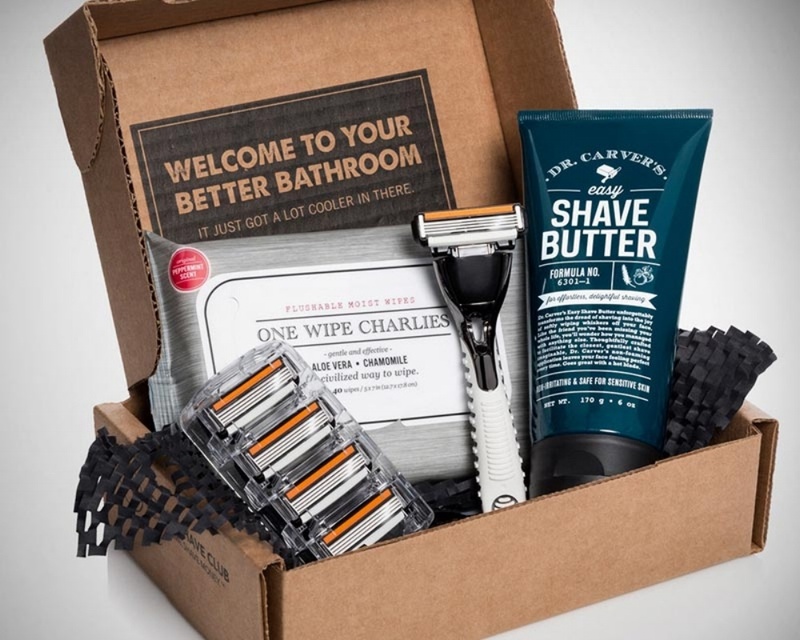 What's next for Dollar Shave Club on their way to "King of the Bathroom" status? Shampoos and conditioners? Body soap? Acne products. Oral hygiene. Then towels? Brushes and combs? Condoms? All shipped free, with relevant content.